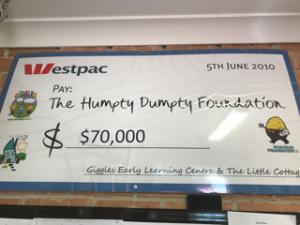 $70,000 in total was raised for the Humpty Dumpty Foundation in 2010. This allowed for the purchase of a much needed infant resuscitation cot for our much loved local St George Hospital. The Humpty Dumpty Foundation generously places a plaque on all medical equipment from its supporters. 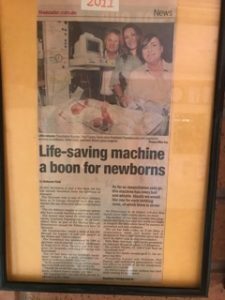 To do this day, we still receive photos of newborns inside the resuscitation cot-from families of our local community or area, that recognise our centres, or have been part of our childcare centre community, with a message thanking us for making this equipment available for their child”. It’s moments like these that keep us motivated and inspired to keep raising funds and continue our philanthropic activities. The rest of the funds went toward a Movement Centre at Westmead Hospital.